The U.S. House Committee on Natural Resources discussed Puerto Rico and the USVI's situations after getting hit with back-to-back hurricanes. The U.S. House Committee on Natural Resources discussed Puerto Rico and the USVI’s situations after getting hit with back-to-back hurricanes. 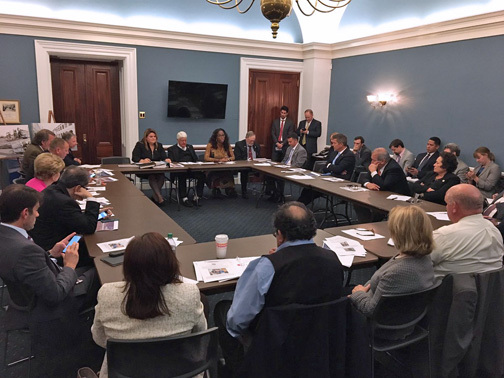 House Committee on Natural Resources Chairman Rob Bishop (R-UT) organized an informal roundtable this week so committee members could discuss the situation in Puerto Rico and the U.S. Virgin Islands after hurricanes Irma and María. Puerto Rico Resident Commissioner Jenniffer González Colón and USVI Delegate Stacey Plaskett each presented to the committee a report on the situation in their respective territories, describing the total physical and economic devastation caused by the storms and the stages of progress in the response and recovery effort, as well as estimates of damages. Both spoke about the experiences of their constituents and thanked the members of the committee for the commitment expressed to support the rebuilding needs. Committee staff reviewed for the members the jurisdiction and competencies of the committee, which has oversight over the territories’ administration. This enables the committee to act in aspects such as streamlining administrative regulations; however, for other financial, labor or health service type actions it will require working together with the other committees with primary jurisdiction. That includes moving forth the emergency response legislation that may be pending before these committees. One issue that is within the Natural Resources Committee jurisdiction is Title V of the Puerto Rico Oversight, Management and Economic Stability Act (PROMESA,) which defines critical infrastructure projects and that may be something to which to consider having the Oversight Board change focus or even to amend. The Chairman and members of the committee agreed with both Caribbean Congresswomen that there must be a new vision of the Federal Emergency Management Agency’s mandate, so that it should not be merely to restore what existed on the day of landfall as it was, but to cooperate with a reconstruction that is up to current standards and less vulnerable to future hazards. “I want to thank Resident Commissioner Jenniffer González and Delegate Stacey Plaskett for their leadership,” Bishop said. “Their contributions to today’s forum were extremely beneficial for our members in helping to understand the situations on the ground and the unique challenges facing both territories,” he added. “I look forward to working with both of them, along with all of our members, local officials and federal partners to ensure expedient recovery and rebuilding,” he said. Hey Buddy!, I found this information for you: "US House members discuss PR/USVI status after storms". Here is the website link: https://newsismybusiness.com/members-discuss-storms/. Thank you.